Our July Friday Showcase presenter is Glen Waples. We welcome members and guests to see Glen’s quilts and hear the stories behind them as she shares her quilting journey in our Showcase this Friday 7 July at 10am in our Pitt Street office. 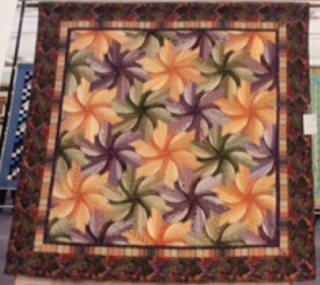 Glen has been quilting for almost twenty-five years and enjoys adapting elements of designs she finds, particularly in antique quilts, to draft patterns for her own unique works. Glen is also a passionate hand quilter. As a regular volunteer in our office, Glen readily share tips on quilting so this promises to be an interesting and informative Showcase. QuiltNSW holds Friday Showcase at our office (just behind Town Hall station at 276 Pitt Street, Sydney) on the first Friday of most months with the presentation starting at 10 am. Visitors are most welcome so bring a friend along - $5 for members and $10 for visitors. The full schedule of upcoming showcases is on our website. We look forward to welcoming you to our office this Friday.